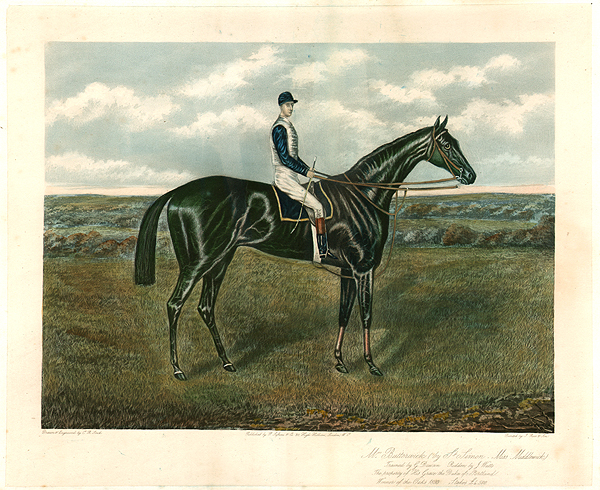 An antique print entitled "A rising Star" produced for the famous Victorian Magazine "Vanity Fair" founded by Thomas Gibson Bowles which commenced publication in 1869. For about forty five years caricatures of famous and infamous personalities were carried in the weekly issues of Vanity Fair. Subjects included Royalty, judges, politicians, musicians, sportsmen, artists, actors and criminals of Victorian and Edwardian Britain. This print by 'Spy' was published on 7th November, 1906. 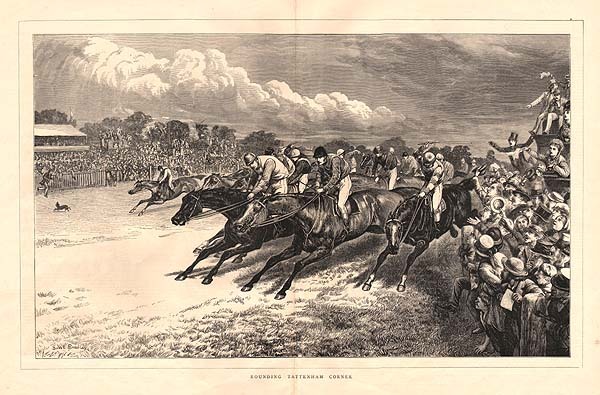 More Info An antique print entitled "The Winning Post" produced for the famous Victorian Magazine "Vanity Fair" founded by Thomas Gibson Bowles which commenced publication in 1869. This print by Lib was published on 8th August, 1888. Caricature of Group of jockeys and their horses. John Osborne, Tom Cannon, John Watts, Fred Webb, Fred Barrett, George Barrett, William Robinson and Fred Rickaby. 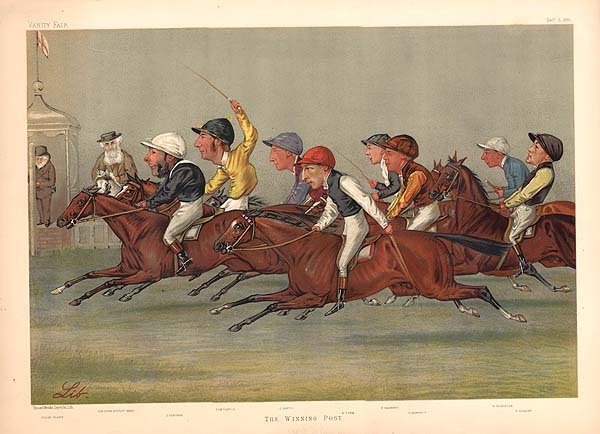 An antique print entitled "The Winning Post" produced for the famous Victorian Magazine "Vanity Fair" founded by Thomas Gibson Bowles which commenced publication in 1869. This print by Lib was published on 8th August, 1888. Caricature of Group of jockeys and their horses. John Osborne, Tom Cannon, John Watts, Fred Webb, Fred Barrett, George Barrett, William Robinson and Fred Rickaby. 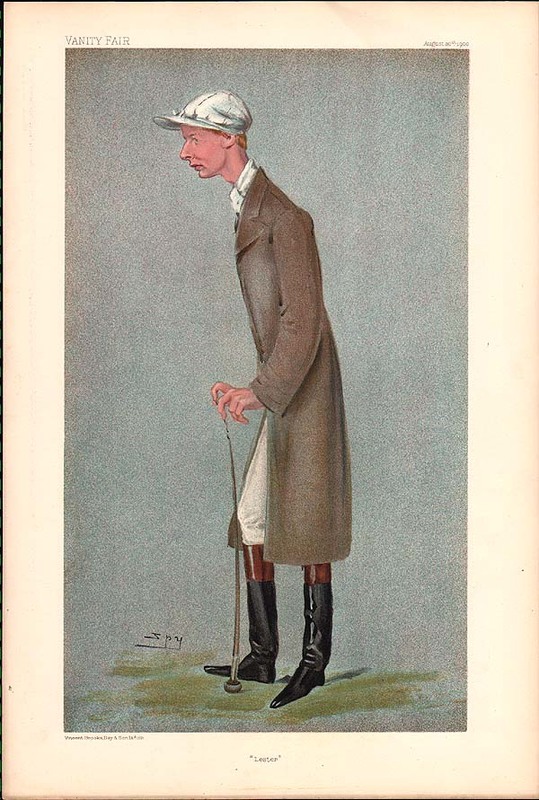 An antique print entitled "Lester" produced for the famous Victorian Magazine "Vanity Fair" founded by Thomas Gibson Bowles which commenced publication in 1869. For about forty five years caricatures of famous and infamous personalities were carried in the weekly issues of Vanity Fair. Subjects included Royalty, judges, politicians, musicians, sportsmen, artists, actors and criminals of Victorian and Edwardian Britain. This print by Spy was published on 30th August, 1900. An antique print entitled "J. E. Watts" produced for the famous Victorian Magazine "Vanity Fair" founded by Thomas Gibson Bowles which commenced publication in 1869. For about forty five years caricatures of famous and infamous personalities were carried in the weekly issues of Vanity Fair. Subjects included Royalty, judges, politicians, musicians, sportsmen, artists, actors and criminals of Victorian and Edwardian Britain. This print by A was published on 1st October, 1903. 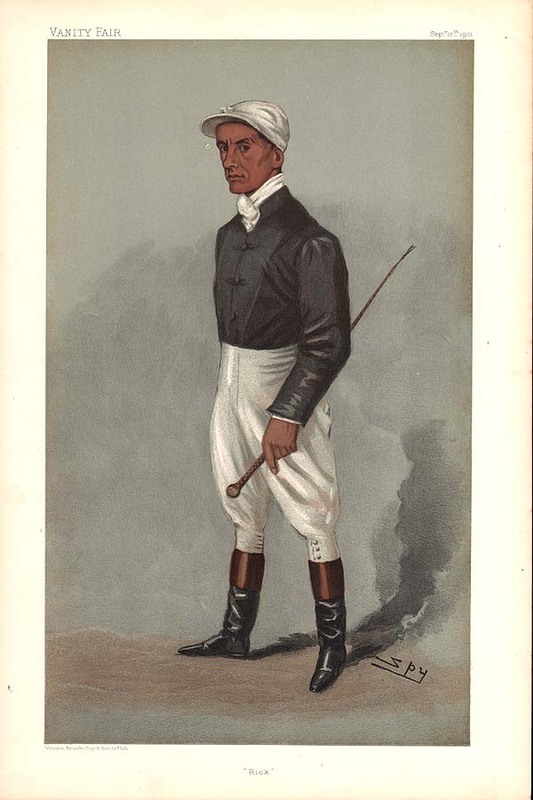 An antique print entitled "James Woodburn" produced for the famous Victorian Magazine "Vanity Fair" founded by Thomas Gibson Bowles which commenced publication in 1869. For about forty five years caricatures of famous and infamous personalities were carried in the weekly issues of Vanity Fair. Subjects included Royalty, judges, politicians, musicians, sportsmen, artists, actors and criminals of Victorian and Edwardian Britain. This print by Spy was published on 21st June, 1890. 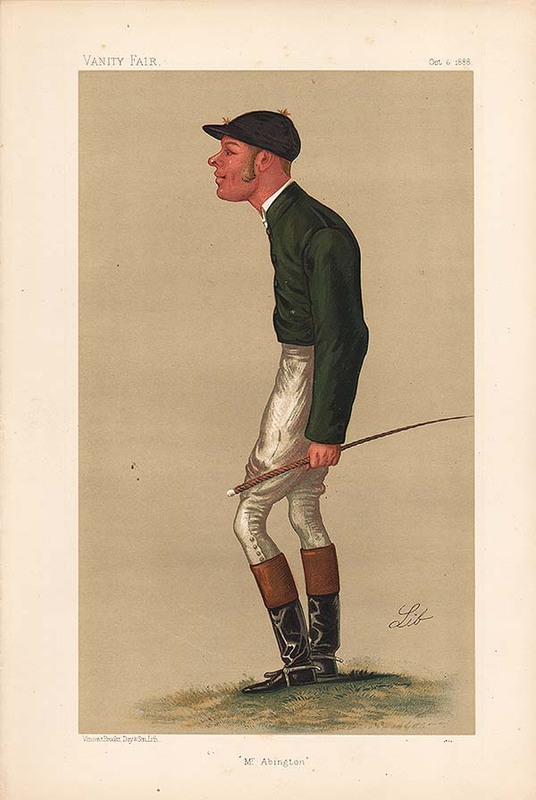 An antique print entitled "Sam Loates" produced for the famous Victorian Magazine "Vanity Fair" founded by Thomas Gibson Bowles which commenced publication in 1869. For about forty five years caricatures of famous and infamous personalities were carried in the weekly issues of Vanity Fair. Subjects included Royalty, judges, politicians, musicians, sportsmen, artists, actors and criminals of Victorian and Edwardian Britain. This print by Spy was published on 5th November, 1896. 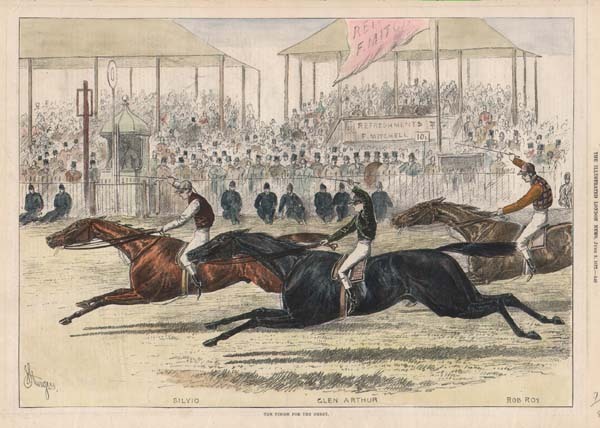 An antique print entitled "He rides for Lord Durham" produced for the famous Victorian Magazine "Vanity Fair" founded by Thomas Gibson Bowles which commenced publication in 1869. For about forty five years caricatures of famous and infamous personalities were carried in the weekly issues of Vanity Fair. Subjects included Royalty, judges, politicians, musicians, sportsmen, artists, actors and criminals of Victorian and Edwardian Britain. This print by Spy was published on 28th November, 1906. 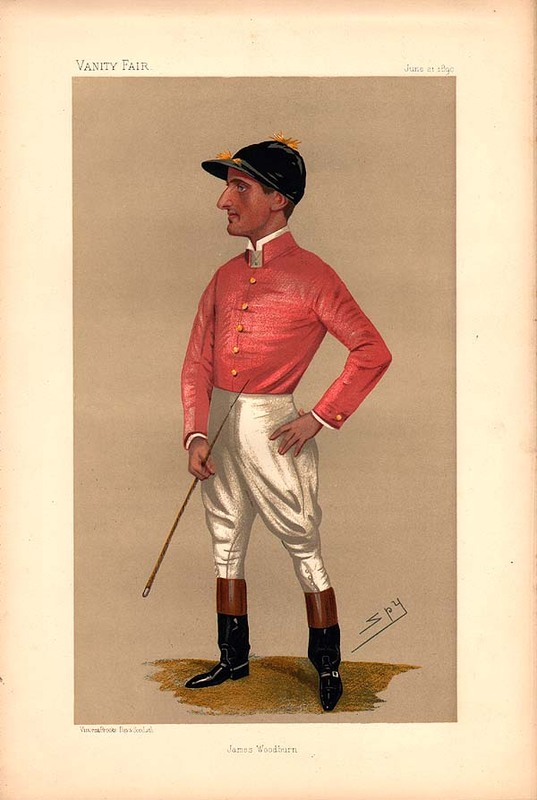 An antique print entitled "George Barrett" produced for the famous Victorian Magazine "Vanity Fair" founded by Thomas Gibson Bowles which commenced publication in 1869. For about forty five years caricatures of famous and infamous personalities were carried in the weekly issues of Vanity Fair. Subjects included Royalty, judges, politicians, musicians, sportsmen, artists, actors and criminals of Victorian and Edwardian Britain. This print by Spy was published on 3rd September, 1887. An antique print entitled "Frank Wootton" produced for the famous Victorian Magazine "Vanity Fair" founded by Thomas Gibson Bowles which commenced publication in 1869. For about forty five years caricatures of famous and infamous personalities were carried in the weekly issues of Vanity Fair. Subjects included Royalty, judges, politicians, musicians, sportsmen, artists, actors and criminals of Victorian and Edwardian Britain. This print by Spy was published on 8th September, 1909. 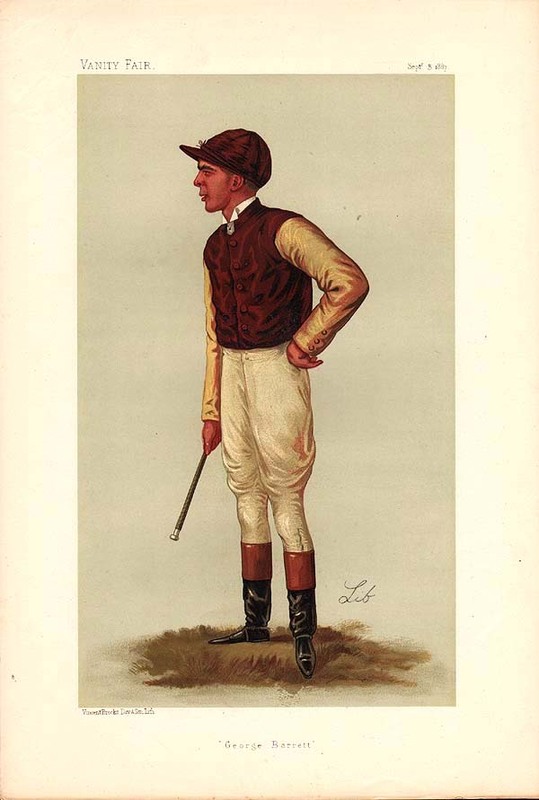 An antique print entitled "Rick" produced for the famous Victorian Magazine "Vanity Fair" founded by Thomas Gibson Bowles which commenced publication in 1869. For about forty five years caricatures of famous and infamous personalities were carried in the weekly issues of Vanity Fair. Subjects included Royalty, judges, politicians, musicians, sportsmen, artists, actors and criminals of Victorian and Edwardian Britain. This print by Spy was published on 12th September, 1901. An antique print entitled "Morny" produced for the famous Victorian Magazine "Vanity Fair" founded by Thomas Gibson Bowles which commenced publication in 1869. For about forty five years caricatures of famous and infamous personalities were carried in the weekly issues of Vanity Fair. Subjects included Royalty, judges, politicians, musicians, sportsmen, artists, actors and criminals of Victorian and Edwardian Britain. This print by Spy was published on 24th October, 1891. 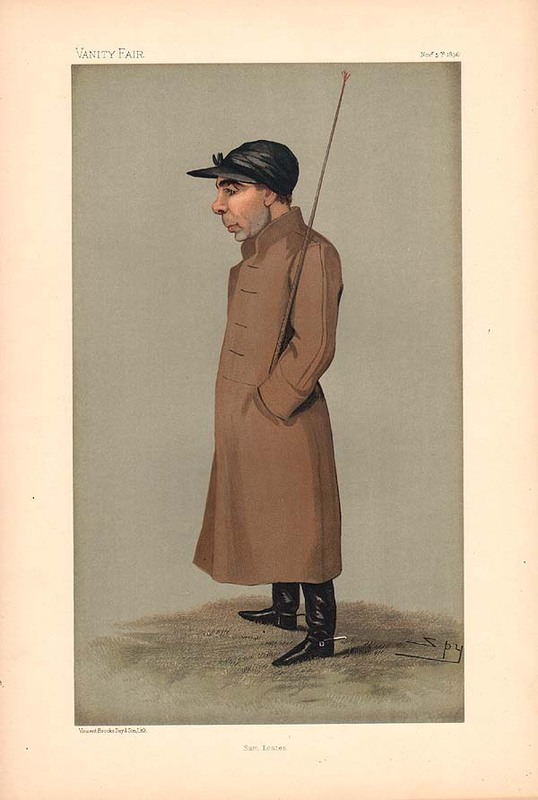 An antique print entitled "Mr Abington" produced for the famous Victorian Magazine "Vanity Fair" founded by Thomas Gibson Bowles which commenced publication in 1869. For about forty five years caricatures of famous and infamous personalities were carried in the weekly issues of Vanity Fair. Subjects included Royalty, judges, politicians, musicians, sportsmen, artists, actors and criminals of Victorian and Edwardian Britain. This print by 'Lib' was published October 6th, 1888. 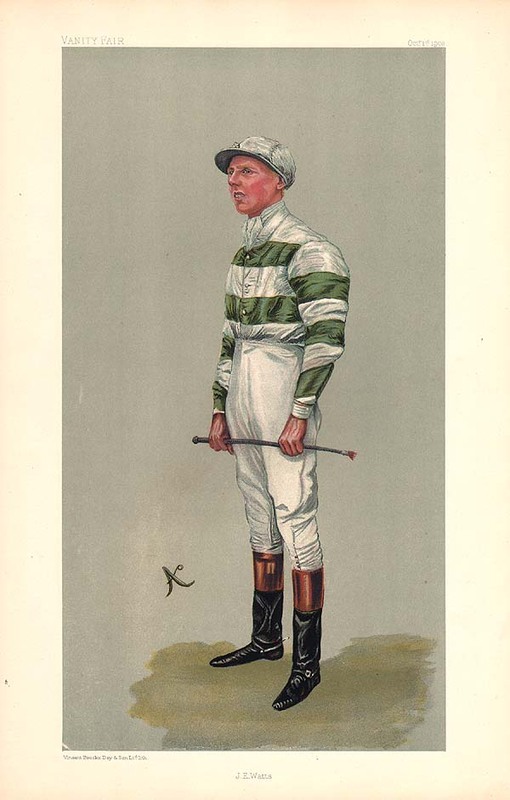 More Info An antique print entitled "an American Jockey" produced for the famous Victorian Magazine "Vanity Fair" founded by Thomas Gibson Bowles which commenced publication in 1869. For about forty five years caricatures of famous and infamous personalities were carried in the weekly issues of Vanity Fair. Subjects included Royalty, judges, politicians, musicians, sportsmen, artists, actors and criminals of Victorian and Edwardian Britain. This print by 'G.D.G.' was published May 25th, 1899. Two repaired marginal tears not affecting image. 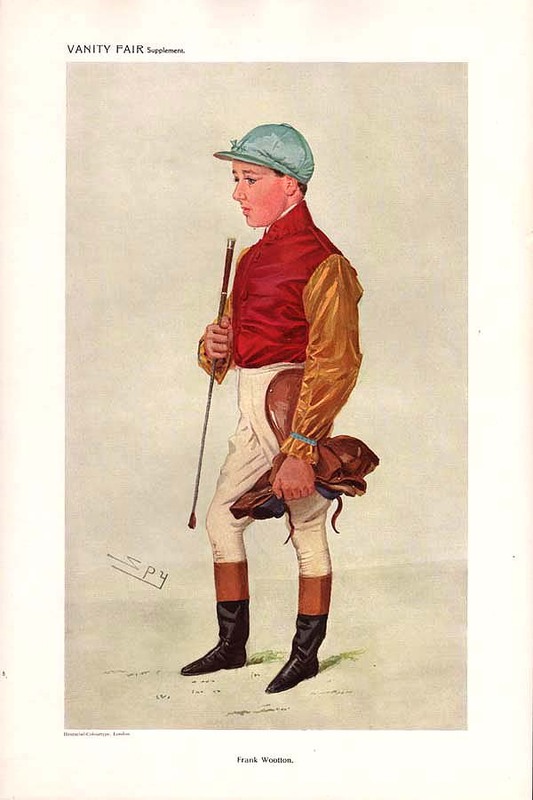 An antique print entitled "an American Jockey" produced for the famous Victorian Magazine "Vanity Fair" founded by Thomas Gibson Bowles which commenced publication in 1869. For about forty five years caricatures of famous and infamous personalities were carried in the weekly issues of Vanity Fair. Subjects included Royalty, judges, politicians, musicians, sportsmen, artists, actors and criminals of Victorian and Edwardian Britain. This print by 'G.D.G.' was published May 25th, 1899. Two repaired marginal tears not affecting image. An antique print entitled "Skeets" produced for the famous Victorian Magazine "Vanity Fair" founded by Thomas Gibson Bowles which commenced publication in 1869. For about forty five years caricatures of famous and infamous personalities were carried in the weekly ssues of Vanity Fair. Subjects included Royalty, judges, politicians, musicians, sportsmen, artists, actors and criminals of Victorian and Edwardian Britain. This print was published on 5th June, 1907. 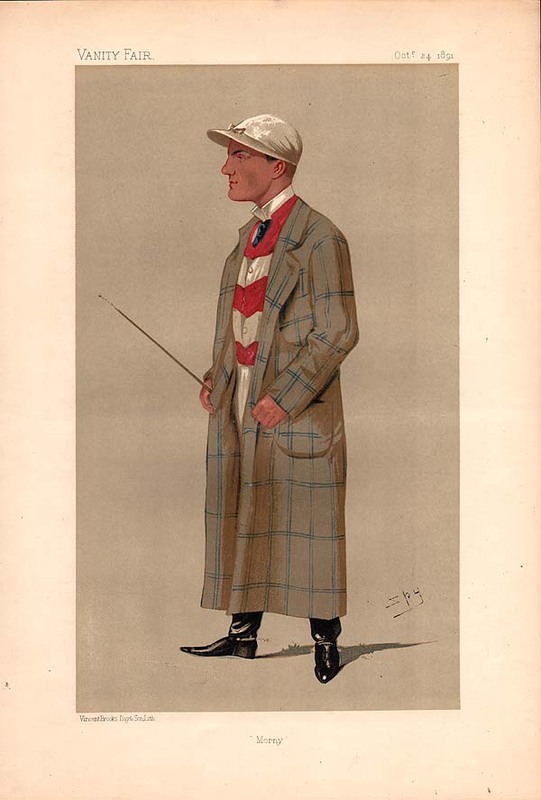 An antique print entitled "Bernard" produced for the famous Victorian Magazine "Vanity Fair" founded by Thomas Gibson Bowles which commenced publication in 1869. For about forty five years caricatures of famous and infamous personalities were carried in the weekly issues of Vanity Fair. Subjects included Royalty, judges, politicians, musicians, sportsmen, artists, actors and criminals of Victorian and Edwardian Britain. This print by 'Spy' was published on 12th September, 1906. Three antique woodcut engravings which were published in "The Illustrated London News" on November 1st, 1745 with later hand colouring. 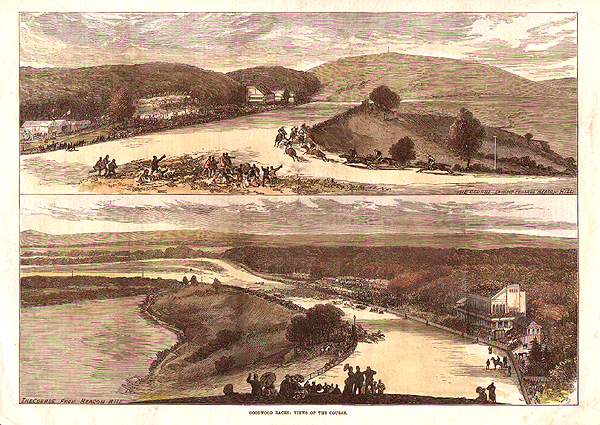 Top engraving "Newmarket in the Olden Time", middle engraving "The Training Ground, Newmarket" and bottom "View of Newmarket". 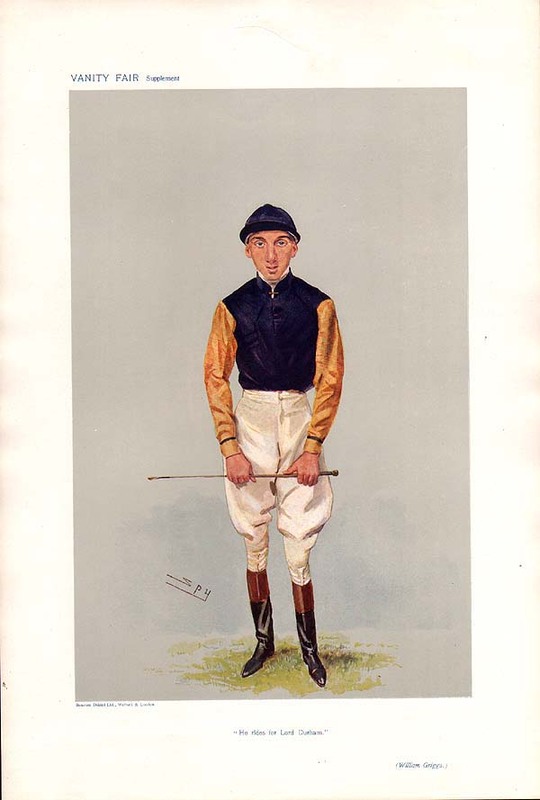 "The General" Gordon Richards who has beaten Fred Archer's Record. 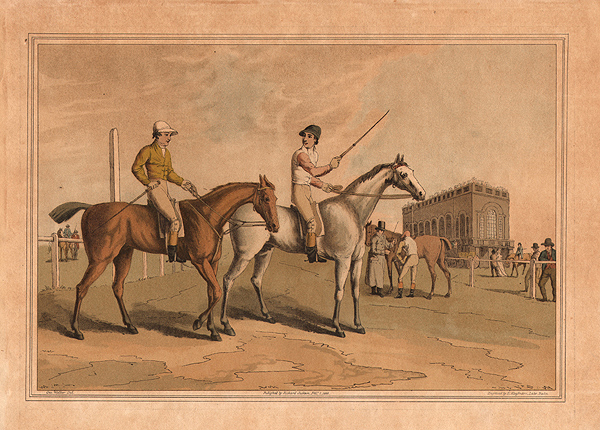 A chromolithograph published in a 'Supplement to The Tatler. November 22nd, 1933. 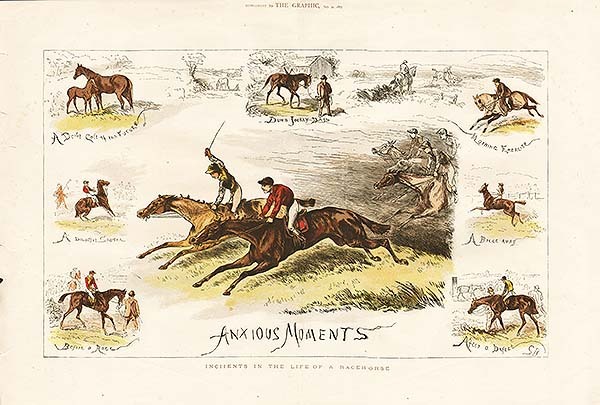 Anxious Moments - Incidents in the life of a Racehorse. An antique woodcut engraving which was published in a "Supplement to The Graphic" on July 31st, 1875. Colour printed. Vertical centrefold as published. 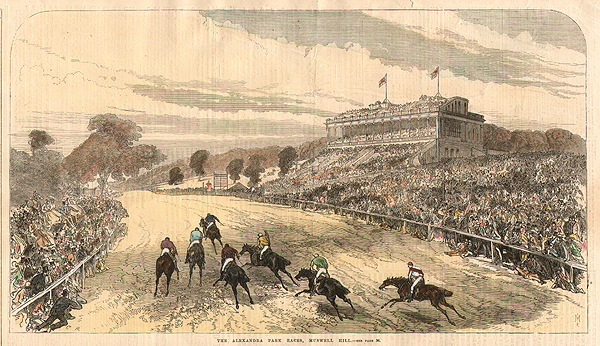 The Alexandra Park Races, Muswell Hill. An antique woodcut engraving which was published in "The Illustrated London News" July 11th, 1868 with later hand colouring. 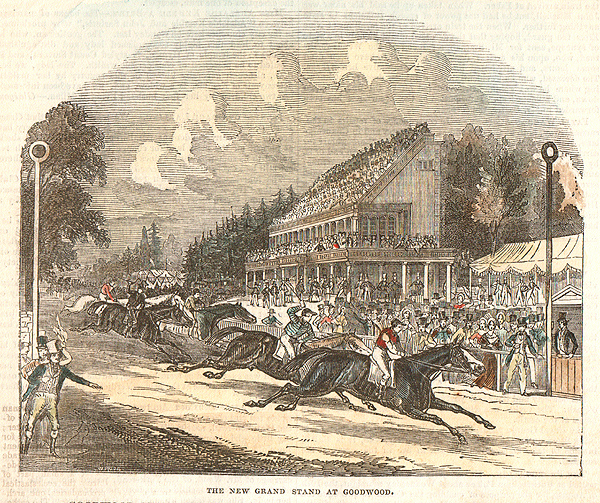 The New Grand Stand at Goodwood. An antique woodcut engraving which was published in "The Illustrated London News" on July 30th, 1842 with later hand colouring. M. Cannon, J. Watts, F. Rickaby, T. Loates and Tod Sloan. A supplement to "The Illustrated Sporting and Dramatic News" published May 27th, 1899. 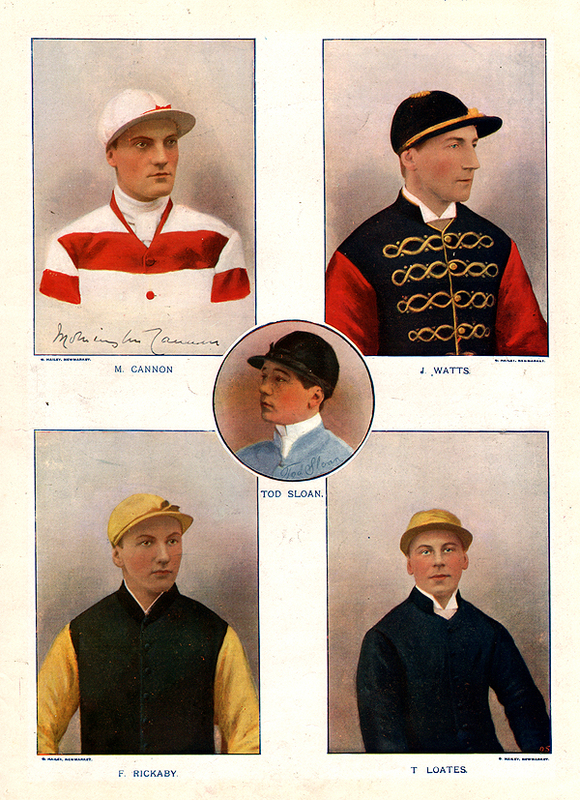 Contains images of M. Cannon, J. Watts, F. Rickaby, T. Loates and in the centre Tod Sloan. An antique aquatint engraving, drawn and engraved by C. R. Stock. Printed by T. Ross & Son. "Trained by G. Dawson, Ridden by J. Watts, The property of His Grace the Duke of Portland. 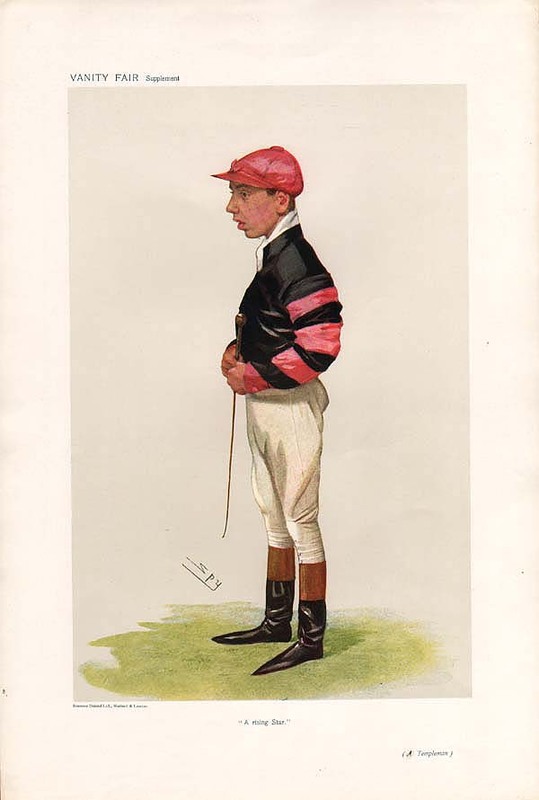 Winner of the Oaks 1893. Stakes £4,500. 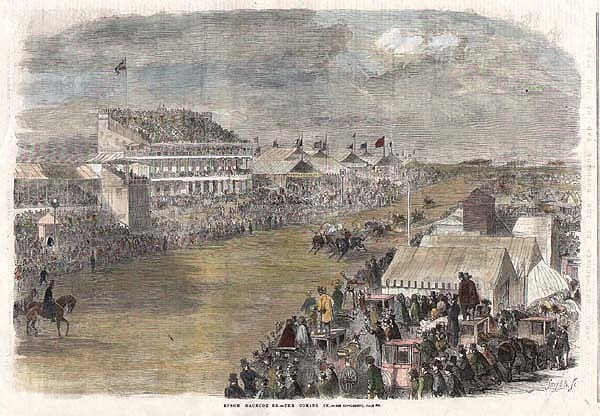 The New Racecourse, Bristol: View from near the Grand Stand. More Info An antique woodcut engraving which was published in "The Illustrated London News" on March 22nd, 1873. Later coloured by hand. An antique woodcut engraving which was published in "The Illustrated London News" on March 22nd, 1873. Later coloured by hand. 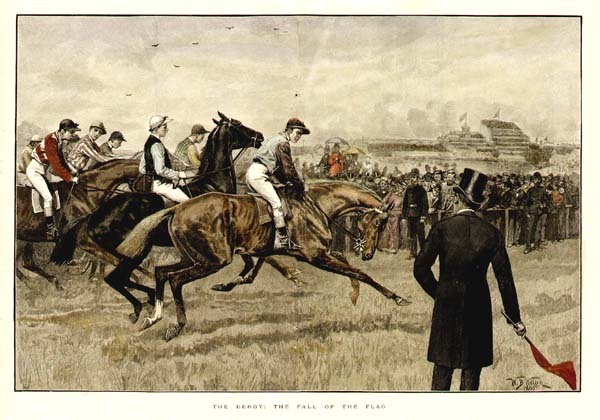 The Derby - At the Starting Post. An antique woodcut engraving after Basil Bradley which was published in "The Graphic" on June 1st, 1872. Epsom Racecourse - The Coming in. 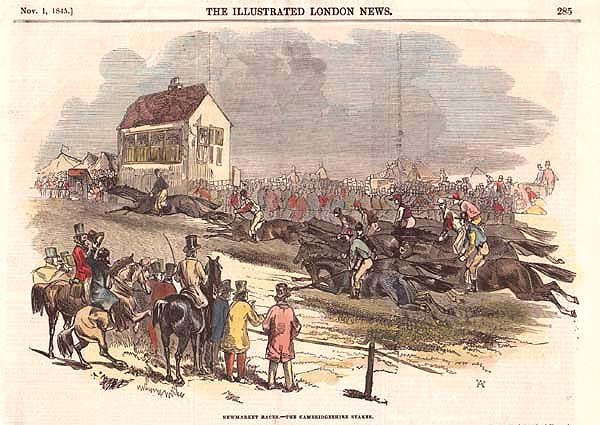 An antique woodcut engraving which was published in "The Illustrated London News" on May 26th, 1860. Later coloured by hand. 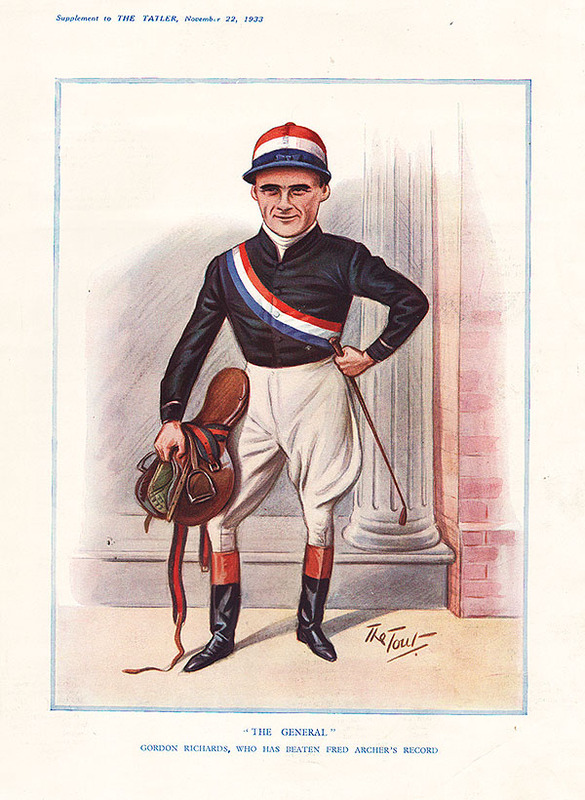 Celebrities of the Turf - Caricatured by Fred Muray. 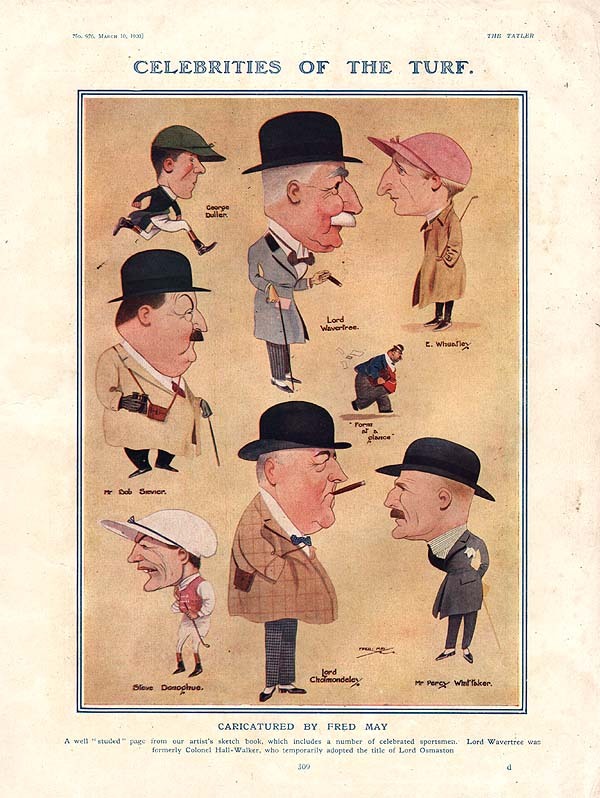 Caricatures by Fred May which were published in "The Tatler" on March 10th, 1920. Characters include Lord Wavertree (who temporarily adopted the title Lord Osmaston), Lord Cholmondeley, George Duller, E. Wheatley, Mr Bob Sievier, Steve Donohue and Mr Percy Whittaker. Fred May was a caricaturist and painter. May's earliest drawings were produced for the North Eastern Daily Gazette and his first cartoons for the Tatler were sent home in 1917 from the trenches where he was serving as an infantry officer. He continued to work for the Tatler until his death in 1976. An antique woodcut engraving which was published in "The Graphic" on June 4, 1870. X Y Z by Haphazard. An antique line engraving after Sartorius. Published in 1818 by J. Wheble. Later coloured by hand. An antique aquatint engraving by E. Kaufmann after George Walker. Published by Richard Jackson in 1885. Original colouring. Overall yellowing due to age. 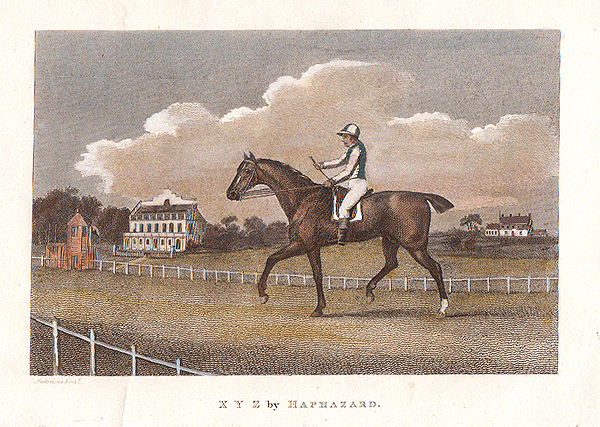 An antique aquatint engraving by J. Harris after a drawing by H. Alken. 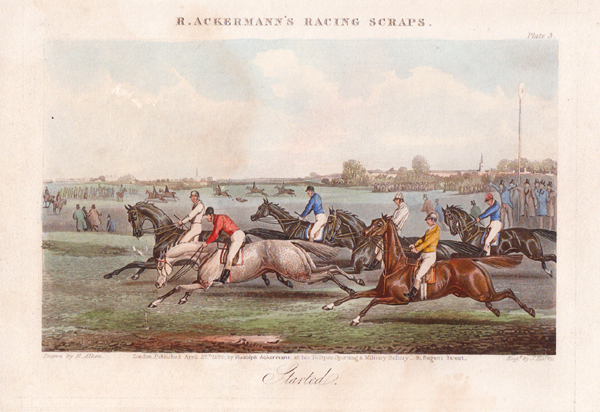 Published April 27th, 1850 by Rudolph Ackermann at his Eclipse Sporting & Military Gallery - 191, Regent Street. Original colouring. Newmarket Races - The Cambridgeshire Stakes. 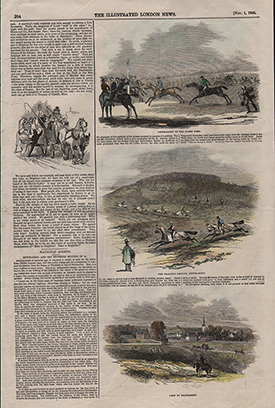 An antique woodcut engraving which was published in "The Illustrated London News"on Nov. 1st, 1845. Later coloured by hand. Goodwood Races : Views of the Course. 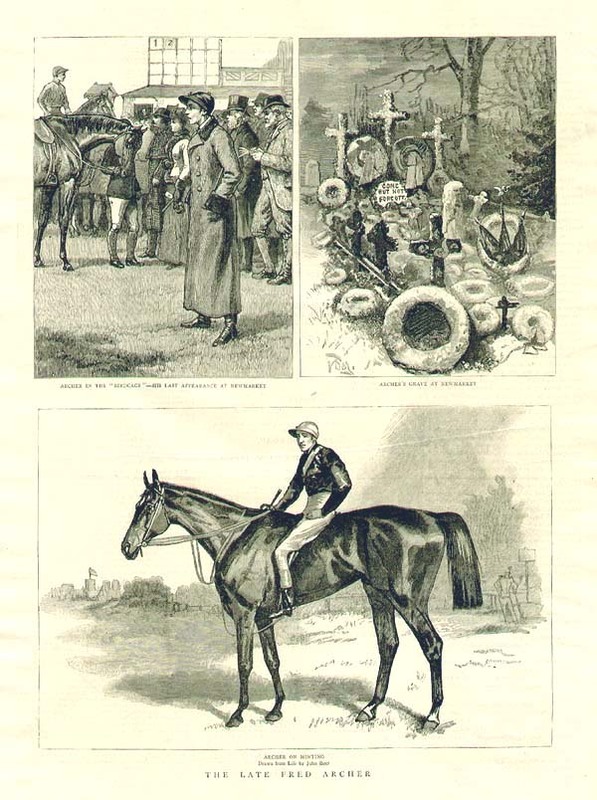 Two antique woodcut engravings which were published in "The Illustrated London News" on July 31st, 1876. Later coloured by hand. The Finish for the Derby. Three antique woodcut engravings which were published in "The Graphic" on November 20th, 1886. Shows Archer in the"Birdcage", his grave and Archer on Minting. The Derby: The Fall of the Flag. An antique woodcut engraving which was published in "The Illustrated London News" on May 30th, 1891. Later coloured by hand. Two pairs of staple holes in centrefold. The First Derby of the new century - The Favourite, "Volodyouski", winning in record time. An engraving after Sidney Paget, which was published in "The Shere" newspaper on June 15th, 1901. The Derby : The Preliminary Canter. A woodcut engraving which was published in "The Illustrated London News" on May 28th, 1892. The colouring is later. 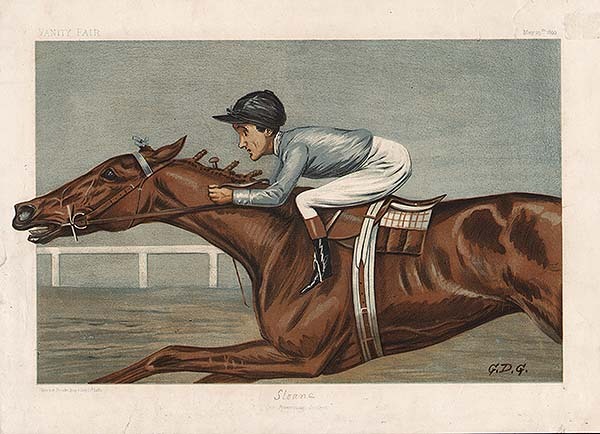 Winner of the Oaks, 1893. Mrs Butterwick (by St. Simon - Miss Middlewick) drawn and engraved by C. R. Stock. Trained by G. Dawson. Ridden by J. Watts. The property of His Grace the Duke of Portland. Original colouring. Caps and Jackets of the Turf. An engraving entitled " Caps and Jackets of the Turf" from an original drawing by J. Sturgess, published in "The Illustrated London News" on May 22nd, 1886. The colouring is original. 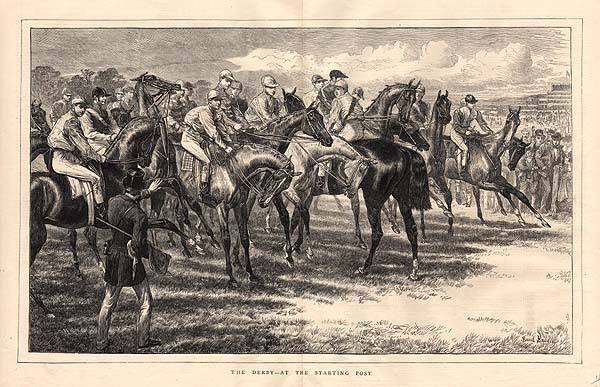 An engraving entitled " The Derby Favourites" from an original drawing by J. Sturgess, published in a Supplement to "The Illustrated London News" on May 30th, 1896. The colouring is original.